Senator Scott Wiener represents California's 11th District encompassing San Francisco and parts of Daly City and South San Francisco. Senator Scott Wiener is one of the newly elected members of the California legislature, replacing termed-out Senator Mark Leno to represent San Francisco. Formerly a San Francisco County Supervisor, he comes to the Senate with a strong interest in transportation and housing, among other issues. He has been appointed to the Senate Transportation and Housing Committee, which is chaired by Senator Jim Beall, as well as committees on energy, utilities and communications and public safety. The freshman Senator also has been assigned to chair the Human Services Committee and to serve on the Appropriations Committee, which oversees budget allocations. Streetsblog sat down with him a few weeks ago to find out where he stands on SBCA issues. We spoke first about transportation funding. Senator Wiener made it clear that he recognizes the importance of investing in public transit as well as maintaining the rest of the transportation system. “All too frequently in Sacramento, once transportation funding moves forward it’s overwhelmingly for roads, with very little for public transportation.” That needs to change, he said. Transit “shouldn’t have to beg” for funds to operate. Senator Jim Beall’s S.B. 1, which will likely be the foundation for conversations about transportation funding in this legislative session, has some money for transit, but focuses mostly on roads. The bill was originally introduced last year as part of the Transportation Special Session but ultimately went nowhere, and has been reintroduced for the current session. Senator Wiener says he is working with transportation committee chair Beall to make sure transit is not overlooked in funding bills as they go forward. “We know the Bay Area’s going to grow by two million people in the next 25 years. L.A. is growing; the state as a whole is growing. We can’t just keep doing things in California the way we have done the last fifty years,” said Wiener. 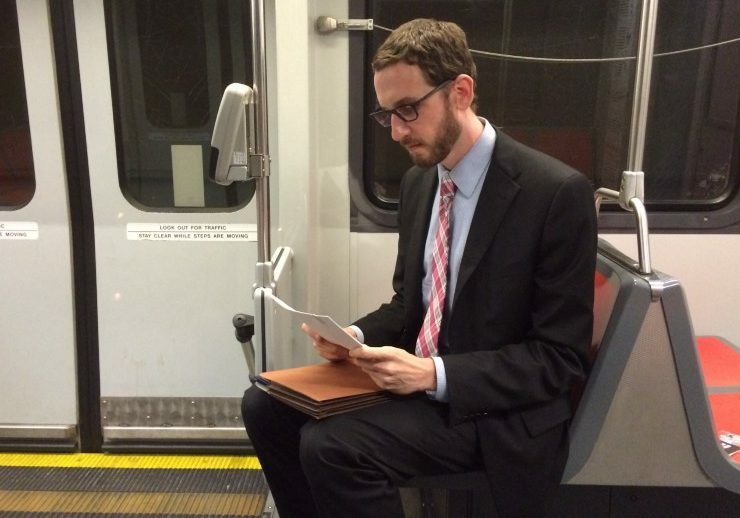 Yes, the freshman Senator uses public transportation, sometimes as a work space. He also emphasized the importance of making sure that, as the state invests in improving roads, all users are considered. “I think the state has a roll to play in incentivizing communities to build complete streets,” he said. “We’re going to increase the state investment in roads, which I support as long as it includes transit investment. As communities are resurfacing and rebuilding roads, it’s really important to keep street safety and livability and complete streets in mind.” We don’t want to rebuild streets “the way they were built in the ’40s and ’50s and ’60s,” he says, ticking off another priority. Another priority for the Senator—although not something that he plans to focus on right away—is revisiting the vehicle code, especially as it pertains to bikes. Wiener authored legislation in San Francisco to allow bicyclists to treat stop signs as “yield” signs, partly in response to a draconian crackdown by the SFPD, but the local regulation was ultimately vetoed by San Francisco Mayor Ed Lee. When asked about incorporating complete streets into the funding bill, Senator Wiener said he definitely wants to see that happen. As currently written, S.B. 1 includes a mild requirement for Caltrans to update its guidance on complete streets, but that’s as far as it goes. The bill has little teeth to require paving or maintenance projects funded by it, for example, to improve conditions for people who walk or ride a bike. “If you conditioning funding on designing streets in a certain way, then it becomes stronger,” said Wiener. The Senator also has a big interest in housing, including affordable housing, and energy policies. He has already introduced two bills, S.B. 35 – to make it easier to build housing, and S.B. 71 – to encourage clean energy. S.B. 35 is a direct response to Governor Jerry Brown’s budget proposal and his call for legislation to fix housing policy. “There were some problems with [the governor’s by-right proposal last year]—it was not perfect. But I argued that we should be working with the governor to make changes to it. I have enormous respect for the governor for having called the question,” said the Senator. In other words, locals have to make a good-faith effort to meet regional housing goals set by the regional planning body, or give up some of the methods they currently use to block housing from being built in their communities. More information about S.B. 35 is available on this PDF. “The goal being, of course, that it will never kick in,” said Wiener, because cities will try to meet their housing goals. Both bills align with Senator Wiener’s concerns about climate change. “The solar bill is going to help move the dial” in terms of lessening dependence on dirty energy. “And then housing: having good, well-planned, transit oriented, compact housing—that’s one of the most critical things we can be doing to meet our climate goals,” he said. Senator Beall’s transportation funding bill, S.B. 1, is set for its first committee hearing in Sacramento on February 14.
densely populated cities such as Hong Kong or Seoul. How would you propose reducing vehicles in SF when Lyft and Uber actually increase vehicle presence? Displacing vehicles from the main roads such as Geary onto smaller residential streets is counterproductive and utterly ignores the purpose of main streets, namely allowing higher volume of vehicles to transport people and goods. The Board of Supervisors and the MTA attempts to force social engineer in SF does not work. SF has slightly more than 10% of the Bay Area population. Far, far more people move into non-SF cities, i.e. SF = “not so much”. For the majority of Bay Area residents, you couldn’t pay them to live in SF proper. Nice place to visit, but…. This doesn’t seem to match reality on the ground. “SF proper” median housing prices are more expensive than any other place in the bay area, and development in SF is still quite hot, despite (rather stupid) restrictions on development there. That isn’t surprising, as SF is still a relatively nice place, whereas badly planned suburban sprawl has destroyed many of the surrounding areas and turned them into strip-mall-hell. I’m all for transit underground, but a subway would easily cost more than $300 million per mile; whereas with BRT you get a much longer high quality transit facility for a much lower price tag. BRT provides long term benefit because the stations that get built give it a level of permanence most bus routes do not enjoy (as they can often be rerouted due to new developments), while also providing transit time reductions to the user. When you look at the EIR, it appears that construction impacts were accounted for; whether or not it meets your intended level of detail is a subjective opinion. Using construction impacts to argue against a project is the worst logic you could possibly use. All potential projects will have construction impacts; it’s whether or not they can be mitigated or lessened through a fund (which SF has often done) to impacted businesses. On real solutions- a real solution for one of the most densely populated cities in our country would be roadspace reallocation; taking away road space from a transportation option that occupies a large amount of urban space per person and giving it to another option which occupies less- such as a bus or bike or pedestrian. That’s why Geary BRT is being discussed in the first place. More bicyclists wouldn’t be a problem, and studies throughout the world have shown that more cyclists and more cycling infrastructure actually make roads safer for all users. I do agree with you on priority development areas (a Plan Bay Area goal) and reducing development burdens such as parking minimums which drive up the cost of the project without using more innovative solutions. I was in favor of Jane Kim winning the Senator race, but if these are the first two bills Weiner is working on, I support his effort. They want to move to the Bay Area. SF proper? … not so much. Underground transit is expensive and usually just a way to take transit off the streets so cars can go faster. It’s better to just get the cars out of the way and let transit avoid congestion caused by lone drivers. Geary BRT could be a great project if it’s built properly, and the NIMBYs in the Outer Richmond aren’t allowed to dilute the project. There are great BRT projects all over the world, including Los Angeles. Build it already! The rest of the country ridicules all San Franciscans. At the same time, everyone wants to come visit here, or move here. Our crazy lives threaten their cookie-cutter suburban ideals. Who cares? I can’t think of anyone more qualified to occupy Mark Leno’s chair in the State Senate. Scott did great work on the SF Board of Supes, and I’m sure he’ll serve us well in Sacto. “Realism” includes admitting that the insane “pave everything!” fever-dreams of the last fifty years have utterly failed, and made California a much worse place. Then the search for better alternatives can begin. Luckily, this guy seems to be pretty realistic. Also, beyond that, his bill is asking for the housing requirements to have teeth, which is what will push those neighboring towns to build up, so, um, yes, exactly. Lol @ someone explaining landuse politics to Scott Wiener. The fantasy is thinking you can solve traffic problems by adding more lanes. Another idealist in Sacramento. We need realists. Outside of SF proper, SF politicians get ridiculed, and not without cause. I’m…. pretty sure he’s well aware of this. Weiner and all of the Board of Supervisors (BOS) in SF missed the main cause in the surge in vehicles on the road is caused by Uber and Lyft. In SF the Municipal Transit Authority (MTA) and BOS forced street level mass transit on the largest street in SF, namely Geary Blvd. Instead of working on a plan to build MASS TRANSIT UNDERGROUND, Weiner and the BOS and MTA collectively rubberstamped the bill of over $300 MILLION over four plus years for the street level Geary BRT project. They shoved this important matter down the throats of San Franciscans without so much as really working with the communities, people, schools, and small businesses that will be directly impacted. See the article here for more details http://sf.streetsblog.org/2017/01/06/geary-bus-rapid-transit-study-approved-by-county-transportation-authority/ and search youtube for more details. Most importantly this construction only is a short term benefit that utterly fails to address the consequences of the diverted traffic aka the ‘displaced vehicles’ onto the adjacent streets. Nowhere does the Geary BRT project address or propose solutions to the considerable congestion it creates throughout the four years of construction (or what happens going forward), and nevermind the environmental nightmare and all around safety hazard! the delicate balance and sacrifices needed to create real solutions. The urgency has only increased since last year, but the only thing all participants seem to agree on is that something needs to be done.